He had the ideal start. After securing a job through the campus placement in a reputed company, he was soon working on data science projects. What followed next is a tale of boldness and faith in oneself. 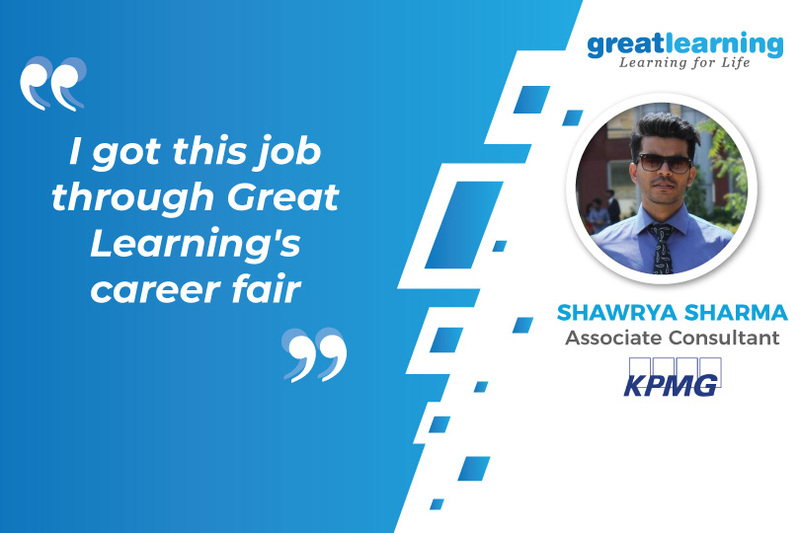 Read on to know how Shawrya Sharma, our DSE alumnus, quit his job and joined the DSE program by Great Learning to upskill himself. Why did you take up the DSE program? I used to work on a data science project where I used to do analysis and stuff in my previous organization, that is when I developed an interest and wanted to learn Data science to upskill myself. So I left my job and took up this program. I was considering three programs – Great Lakes, IIIT, and Manipal. IIIT was more of an online course and the duration of the course by Manipal was one year. I found Great Lakes PGP-DSE program to be better compared to the others and that is the reason why I opted for this course. What did you learn through this program? For our batch, both R and Python were taught. For me, everything went very smooth. The faculties were very nice. Shawrya’s hard-work was paying off. In the Great Learning Excelerate career fair, he was offered multiple roles by leading companies. What career opportunities did you get through the program? I got into this role because of one of the career fairs that happened in Chennai. It was a great chance to be interviewed by some good companies. I had an opportunity to be interviewed by 3 companies from which, I was offered roles by two companies. The projects prepare the candidates for industry-relevant problem-solving. How did you approach your interview with KPMG? I have actually worked on an analytics project on my own and all the three companies asked about the same. I can say that I got into two companies because of that project and the grooming that happened during the program. My Machine learning skills were tested during the interview with KPMG. How did Great Lakes help you advance in your career? Like everyone, even my main concern was placement. But the Great lakes team has contacts with many good companies. If you are sincere and perform well during the program, you will definitely land a job in a good company. I can say that the mock interviews, career fairs, and CV reviews were quite helpful and played a major role in my transition. Would you recommend taking up the PGP-DSE program? I would definitely recommend this course to anybody who is interested, but you have to be thorough with all the concepts of stats before starting or else one might find it a bit difficult as this is a 6-months rigorous program.